It is clear from the modern day prophecies, that a worldwide economic collapse and resulting famine are coming. I do not profess to know the exact sequence of events, except that we will need to leave for refuges after The Great Warning during a time of great turmoil in which food and water will be scarce and the antichrist will be rising to power due to a world-wide war. So, it is definitely advisable to prepare for food and water shortages, especially, if one lives in suburban and city areas and food is trucked in long-distance from farms. I live in such a suburban place and I know nothing of the farm-life. I also do not have much money or space to stock-up on long-term food storage supplies and water. But, I also trust in The Lord and I know that He is a God of plenitude and abundant blessings and surely, He would provide a solution to a situation that will be common to most people–lack of money and lack of space. And, indeed, He has done this. During the 1930s, Our Lady appeared to Mama Rosa Quantrini in San Damiano, Italy. The Blessed Mother revealed that a native fruit in the mission fields–the grapes of San Damiano–would sustain people of faith during the time of the antichrist, wars, famine, droughts, calamities, plagues and illness. One grape would be sufficient for one full day. Also, the Blessed Mother revealed that the blessing bestowed on the grapes of San Damiano could be transferred to grapes elsewhere. So, it is only necessary to have one Mother grape from San Damiano. Once the blessing is transferred to another grape, that grape also becomes a Mother grape that can transfer the blessing to other grapes. Thus, many people can be blessed with food and water from a single grape from San Damiano. Each grape should be blessed with the sign of the cross along with the prayers said below. Also, please know and be assured that Our Lord has said in many messages to various chosen souls and heavenly messengers that He will provide for His people. In the coming famine, He will multiply what little food and water we have, so long as we do not hoard and are charitable towards others. We must not live in fear and live by the Golden Rule–“do unto others as we would like done unto us.” The Lord will bless us as we bless others in their needs. So, however able we are to prepare, pray to The Lord and He will multiply the rest. God bless! Although the source of this blessed grape instruction and prayer is unknown, some attribute it to the Blessed Virgin Mary through an Italian woman, sometime after 1930. 1.75 liter of brandy covers about 3 big bunches of green grapes, which can be stored in twelve 12 oz. canning jars. The blessing of these grapes is transferred from one of the original grapes to the others, now making each grape the Mother grape. These grapes can now be passed on to others so they can make their own sustaining supply. Everyone should try to have at least 180 grapes per person (6 month supply). 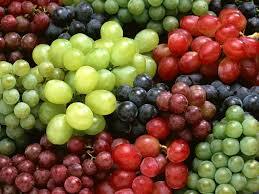 One grape per person a day will sustain you for the whole day. At the time we are to go in to hiding and will be without food, the miraculous sustaining grapes will be our food. These grapes are NOT TO BE SOLD. Cut the grapes with scissors, trying to leave a little piece of the stem on each grape. The brandy used should not be a fruit or berry brandy; use Christian Bros. or B&W Brandy. The large bottle will cover about 200 grapes. Document dated September 15, 2012 Feast of Our Lady of Sorrows. In the name of the Father, and of the Son, and the Holy Spirit, Amen. able to penetrate these grapes. We will now wash these grapes in a solution of mild Ivory soap; rinse the grapes well, until there is no soap residue on them. Once cleansed and rinsed well, we will sprinkle with blessed Holy Water. Oh God, grant that this Holy Water will be endowed with Divine Grace to drive away devils and to cast out diseases. Grant that these grapes, which are sprinkled with this Holy Water, may be freed from everything unclean and delivered from what is hurtful, that threatens the health, the safety, and the peace of all of us present now, especially the dwellers in this house; be banished by the sprinkling of this Holy Water, so that the health of body and soul which we seek by calling upon the name of Jesus and the blessed name of Our Lady, Miraculous Madonna of the Roses, may be guarded from us all. Act of Contrition: Oh my God, I am heartily sorry for having offended thee, and I detest all my sins because I dread the loss of heaven and the pain of hell, but most of all because I offend thee my God, who art all good and deserving of all my love. I firmly resolve with the help of thy grace, to confess my sins, to do penance, and to amend my life. Amen. Our own Guardian Angels… PRAY FOR US… St. Benedict… PRAY FOR US… St. Scholastic… PRAY FOR US… St. Rita… PRAY FOR US… St. Claire… PRAY FOR US… St. Gerard… PRAY FOR US… St. Lorenzo Ruiz… PRAY FOR US… St. Philomena… PRAY FOR US… St. Catherine Laboure… PRAY FOR US… St. Theresa the Little Flower… PRAY FOR US… St. Peregrine… PRAY FOR US. Now we will invoke our dear Mother of many Titles: Our Lady of Lourdes… PRAY FOR US… Miraculous Madonna of the Roses… PRAY FOR US… Our Lady of Rosa Mystica… PRAY FOR US… Our Lady of Fatima… PRAY FOR US… Our Lady of Grace… PRAY FOR US… Immaculate Conception… PRAY FOR US… Our Lady of Medjugorie… PRAY FOR US… Mother of Perpetual Help… PRAY FOR US… Immaculate Heart of Mary… PRAY FOR US… Our Lady of Guadalupe… PRAY FOR US… Our Lady of the Snow… PRAY FOR US… Our Lady of the Miraculous Medal… PRAY FOR US… Our Lady of Mt. Carmel… PRAY FOR US… Our Lady of Refuge… PRAY FOR US… Jesus, Mary and Joseph… PRAY FOR US. St. Michael, St. Raphael, St. Gabriel; Jesus, Mary and St. Joseph; Miraculous Madonna of the Roses, bless our grapes. We now lay before your feet, O Lord Jesus, the wine which will become Holy Wine with your blessing. These grapes that we are presenting to you now, Eternal Father, will become the original grapes which every one of us here present can now touch to other grapes, which we preserve thru your blessing for the latter times. Eternal Father, when we will be made to choose between defending our faith or the material things of this world, we have to choose to defend our faith, so we need your strength, your blessing and your spiritual graces. Since we would like to follow your commandments Oh Lord, we would rather be martyrs than have our hands marked with the mark of the beast. We are preparing now for the time when the choice will be presented to us. So dear Father, through the Most Blessed Virgin Mary, Miraculous Madonna of the Roses, bless our grapes so they now become miraculous sustaining grapes of the latter times. We present these to you now for your blessing, and through this blessing of yours we will be invoking your strength for special perseverance, that as we go into hiding, we will be able to proclaim to the world that in our journey of faith, we’d rather have you with us, than go to the other side. So please bless these grapes and wine so that you can be with us when the time comes to leave this place. We now bless the wine with the Sign of the Cross. This brandy, which has now been blessed, will be used to preserve the grapes, and has medicinal value for the coming diseases. We will now make the Sign of the Cross on each individual grape while invoking the Holy Saints and the Holy Souls to join us in blessing these grapes. St. Joseph… PRAY FOR US… St. Francis of Assisi… PRAY FOR US… St. Padre Pio… PRAY FOR US… St. Jude… PRAY FOR US… St. Anthony… PRAY FOR US… St. Martin de Porres… PRAY FOR US… St. Bernadette… PRAY FOR US… St. Michael… PRAY FOR US… St. Raphael… PRAY FOR US. In the name of the Father, and of the Son, and the Holy Spirit, Amen. Miraculous Madonna of the Roses, bless these grapes. Eternal Father, with this wine originally from San Damiano, please bless this wine to now become a HEALING WINE. We thank God for giving us the grapes, and to be able to know about these things. Eternal Father, Holy Virgin Mother Mary, Holy Infant Jesus, St. Joseph and all the Saints and Angels in heaven, we give thanks for this great grace that you have given a select few of your children, that we come to know all these secrets of heaven for our protection and for our nourishment, and for our healing when the time comes that we would have need of them. And, you let us know these things early enough to be able to make the preparation. Thank you so much Eternal Father, thank you Blessed Mother Mary, thank you very much.